• The Ring Gear or Annulus which has internal teeth and wraps around the entire assembly. • The Sun Gear (shown above in orange) which is the smallest gear and sits in the center of the assembly. 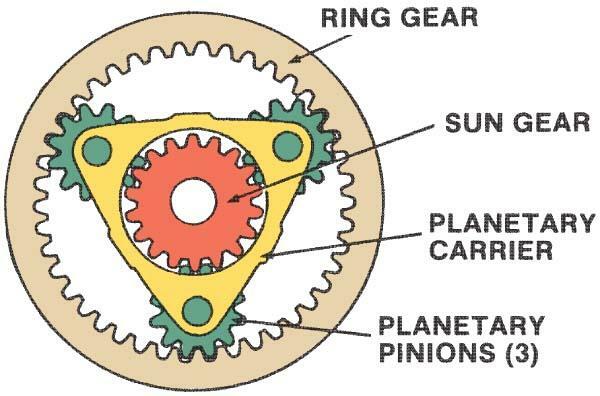 The planetary pinions orbit around the sun gear, hence the name of the gear set. • The Planetary Carrier (shown above in yellow) which holds a set of Planetary Pinion Gears. The Pinion Gears (shown above in green) interact with the Ring Gear and the Sun Gear at the same time.